* Multi-function Car Kit:car charger&Bluetooth headset(single earpiece).Just pick up the headphone from the charging dock to automatically answer a call when charging with the car charger. * FM Transmitter MP3 Player:Enjoy high quality audio via car FM radio. * Advanced Bluetooth Technology: Wireless Bluetooth 4. 1Technology ensures transmitting strong signal in high quality and high speed, delivering high-fidelity stereo music. Bluetooth communication range is up to 10m. * Hands-free & Multipoint Connection: With built-in microphone, it enables hands-free calls to ensure driving safety. It can simultaneously connect to two smart phones, seamlessly switch between your business and personal phones. * Car Charger Function:Car Charger with 5V 2A output current for safe & fast charging. The USB car charger auto-check charging current and can fast charge mobile phones, tablets, music players, etc. A. 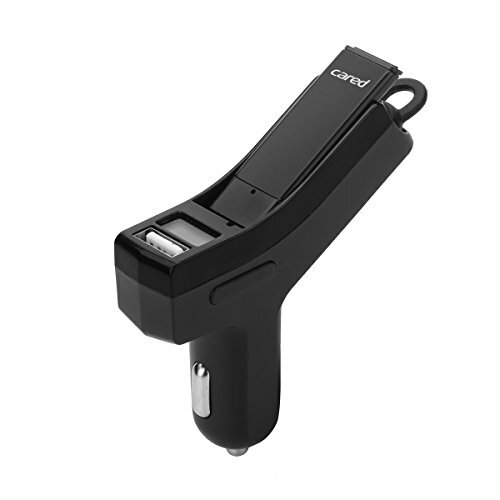 2 in 1 Car Kit: Perfect combo of car charger & Bluetooth headset (single earpiece). Just pick up the headphone from the charging dock to automatically answer a call when charging with the car charger. B. FM Transmitter MP3 Player: Modulate the FM frequency the same as that in the car radio (blank frequency), connect your phone via Bluetooth, then you can enjoy high quality audio via car FM radio. C. Advanced Bluetooth Technology: Wireless Bluetooth 4.1 Technology ensures transmitting strong signal in high quality and high speed, delivering high-fidelity stereo music. Bluetooth communication range is up to 10m. D. Hands-free & Multipoint Connection: Simple and elegant overall appearance and hands-free function with built-in microphone ensure safety driving. E. Car Charger Function: Car Charger with 5V 2A output current, over-current protection for safe & fast charging. The USB car charger auto-check charging current and can fast charge mobile phones,tablets,music players,etc. If you have any questions about this product by CARED, contact us by completing and submitting the form below. If you are looking for a specif part number, please include it with your message.